Students in California who are at least 16, and have completed the tenth grade, or are currently enrolled in the second half of their tenth grade year, are eligible to take the California High School Proficiency Exam (CHSPE). In some ways the test is similar to the GED, but in some ways it’s different. A person must be at least 18 to take the GED test, and that test includes subject areas like science and social studies, which don’t appear on the CHSPE test. 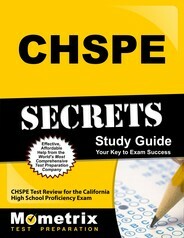 The CHSPE test consists of two sections-math and English. It’s a timed test, which lasts three and a half hours, but you may spend as little or as much time on either section as you like. Basic non-scientific, non-programmable calculators are allowed. The English language skills section does have a writing requirement, but the rest is multiple choice, featuring 84 questions testing for reading comprehension ,analysis , reading for information, grammar, structure, and vocabulary. The math section is all multiple choice and consists of 50 questions about your knowledge of algebra, geometry, probability, statistics, patterns, and problem solving abilities. You must pass both sections, but if you fail one or both, you can retake the test as many times as you like, and once you’ve passed either section you won’t have to take it again. Scores range from 250-450 on each section, and you must achieve at least a 350 to pass either section. Your scores will be mailed to you a few weeks after taking the test. If you don’t have a high school diploma, the CHSPE test is a good option, as state law requires that businesses and organizations treat it as a high school diploma. Ace the CHSPE test using our CHSPE exam study guide with practice questions. 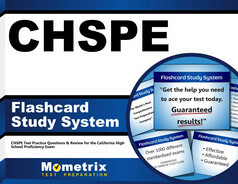 Quickly Solve Difficult CHSPE Test Questions with the CHSPE Flashcard Study System.